There has been so much sadness, anger, and ugliness in the world these days that it's pretty easy to forget how beautiful things are too. 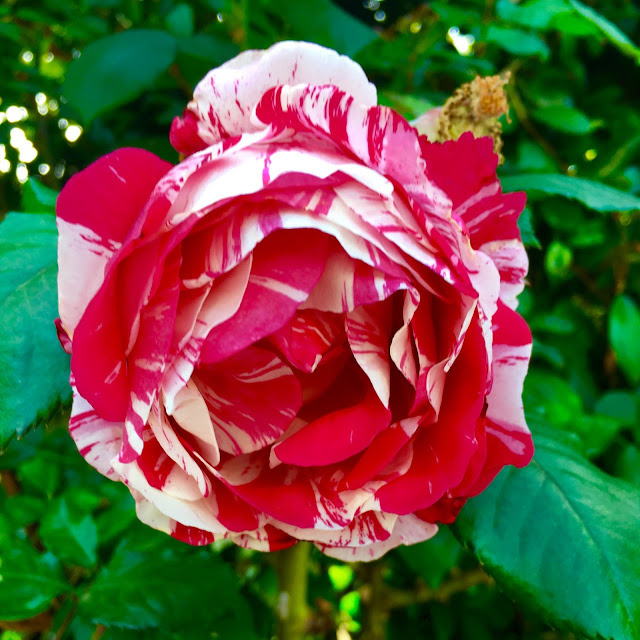 I was walking over to my friend's house yesterday, and this stunning rose on Superba stopped me in my tracks. I could smell its heady fragrance before I even saw it, but then, WOW. Tie-dyed with red and white, it seemed like a perfect symbol of this moment in time. Blood red for all the blood spilled in Florida last Saturday, and white for the hope that I feel that something good can come out of all of this. Like some sanity. We all called Senators and signed petitions and all that yesterday, and it seems like they're finally listening. Senator Chris Murphy stood up for 14 hours yesterday in a filibuster to get the ridiculous Congress to finally have a vote regarding gun control and SOME semblance of sanity in this country. His fortitude is so appreciated, and the result is that there will finally be at least a vote to finally, FINALLY do something about assault weapons in civilian hands. No one is trying to take away all guns - though I wish they were - just to have a sliver of precaution when selling guns. It's ENOUGH already. I'm so happy that I had this rose come along to force me to remember that no matter how bad things get, there is still beauty, there is still compassion, and there are still some people fighting for what's right. Thank goodness.